In 1946 Edward Rohs was left by his unwed parents at the Angel Guardian Home to be raised by the Sisters of Mercy. The Sisters hoped that his parents would one day return for him. In time they married and had other children, but Ed's parents never came back for him. And they never signed the legal papers so that he could be adopted by another family. 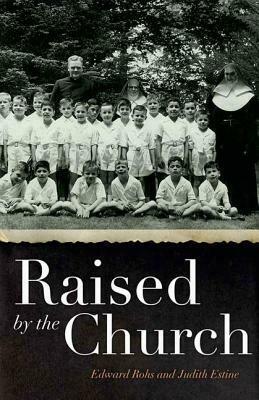 Raised by the Church chronicles the extraordinary life of Ed Rohs, a bright, mischievous boy who was raised in five institutions of the Catholic orphanage system in postwar Brooklyn, New York, from infancy in 1946 until he was discharged as an adult in 1965. Rohs was one of thousands of children taken in by Catholic institutions during the tumultuous post-WWII years: out-of-wedlock infants, children whose fathers had been killed in the war, and children of parents in crisis. Ed gives a brief history of each institution before describing that world-the Sisters and Brothers who raised him, the food, his companions, and the Catholic community that provided social and emotional support. When Ed finally leaves the institutions after nineteen years, he has a difficult time adjusting. He slowly assimilates into "normal" life and determinedly rises above his origins, achieving an advanced degree and career success, working for years in child welfare and as volunteer strength coach for the Fordham University basketball team. He hides his upbringing out of shame and fear of others' pity. But as he begins to reflect on his own story and to talk to the people who raised him, Ed begins to see a larger story intertwined with his own. With original research based on interviews with clergymen and nuns, archival data from the New York Archdiocese, and government records, Raised by the Church tells the social history of an era when hundreds of thousands of Baby Boomers passed through the orphanage system. Through the story of one man, this book gives us a much needed historical perspective on an American society that understood and acknowledged the community's need for a safe haven.